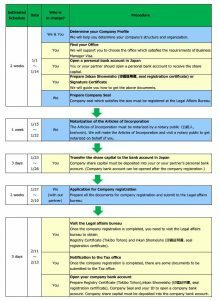 The most common type of business entity for an expat entrepreneur in Japan would be Kabushiki Kaisha (KK), which is often referred to as corporation, incorporation or joint stock corporation and is the most credible and widely utilized business entity in Japan. This article provides detailed information about basic requirements for expat entrepreneurs, procedure and timeline. You must own or rent a physical office space as the registered address of the company for getting “Business Manager” Visa. The immigration would like to check if the office is separated and independent from any other entity and fully equipped with furniture and office supplies. In general, virtual offices, co-working spaces, monthly rental spaces and home offices of employers may not be accepted. Although minimum share capital is only 1 yen under the Japanese law, the investment at least 5 million yen will be required for the acquisition of “Business Manager” Visa. It is also required to explain how you collected the investment amount with written documents such as rental agreement, real estate purchase & sale agreement, your bank statement etc. In order to register a company, the amount of share capital needs to be deposited into investor’s personal bank account in Japan. In general, you cannot open a bank account in Japan without a long-term Visa and staying more than 6 months since you entered Japan. Therefore, it is necessary to find a partner who can receive the capital in the bank account in Japan. This entry was posted in Start Business in Japan. Bookmark the permalink.